Her name has been Becka, Babe, Emma and then finally a "h" was added to the end of the name. 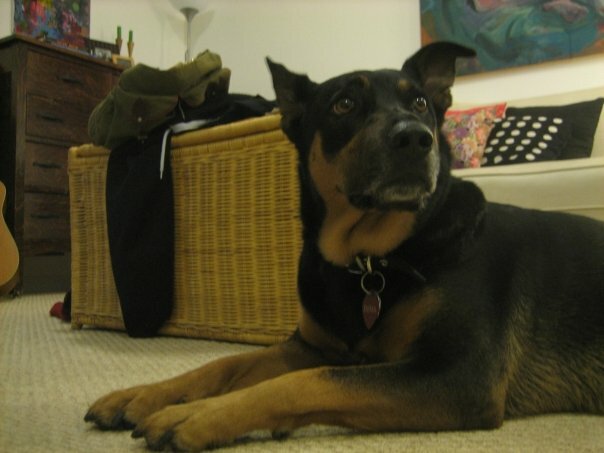 She was found in a rural area in Alberta, Canada in the summer of 2006, with another dog believed to be her brother. Taken in by the Safe Haven Animal Rescue, she was vetted and given the name Babe. Over the next few months, she was fostered for a by a person who decided Babe didn't suit her. Instead, she was then given the name Becka. Jody adopted her that same year and renamed her Emma. In late 2009, Jody asked me to take care of Emma for six months while she found a place that would take dogs, for her and her newborn son, Chance to move into. While in treatment, I was given an assignment to paint - what gives me hope. I didn't know Emma yet. This was just after I'd completed treatment, got a job and had my own place. I thought about getting a dog. A mutual friend of mine and Jody's, mentioned this to Jody. I thought it would be great trial run. I picked Emma up and took her home with me to my one-bedroom basement apartment. I was terrified. How was I going to take care of this creature?! It was accomplished one day at a time, one walk at a time. Six months came and went but Emma stayed with me. Once it was decided I would keep her, I decided to add the "h" on to the end of her name because I'm her human and she's my dog. Emmah and Sarah (that's me!) have been together for nearly nine years.